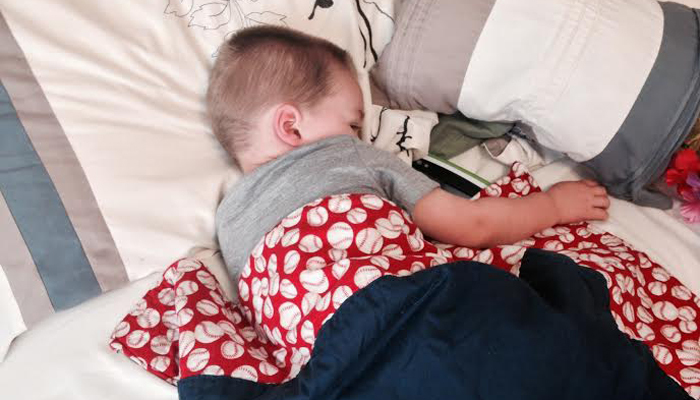 I wrote a few weeks back about how to get your toddler to stay in bed and to sleep. Well, it was as if the parenting gods decided that once I figured out the answer, they would strike it down. Not only that, but now after much resistance, I have come to accept that everything is my fault. Just like I have accepted that it is my fault that the Kid has decided to come back into bed with us. Yes, that’s right. The Kid is back to waking up in the middle of the night and sleeping in our bed. AGAIN! The frustrating part of this is that Mrs. Rookie Dad and I are so sleep deprived from her studying and from me working on what will keep you entertained to come back to my blog that we fail to notice when a 3-foot-man decides to squeeze in between two sleeping giants. You would have thought that money would have been a motivating factor right? I mean, I go to work every day and put in 110% so I can get that paycheck every two weeks. I also have the hope of getting a raise if I do well. It motivates me; I don’t see why it can’t motivate him. It’s almost as though the Kid thinks he is three or something. I mean eventually if he were to stay in his own bed he would get more money so he can buy that Xbox One that I have eyed at Target. Oh wait that’s his money he is getting I must remember that because I’m the one who earns the money. I’ll admit this is annoying that he comes into our bed, right between Hot Momma and me. But, there is something different this time though, when he is coming into our bed, he is staying still. Yeah, I said it! He is staying still when he is sleeping. That means, I can actually get some sleep. Well, maybe I’m the one person in this house getting any sleep because it seems like lately the only person he wants to cuddle with is Hot Momma. Ah crap! I just woke up the parenting gods. Please accept my apology and I hope that tonight you will let me sleep in peace and keeps the Kid lying still while he sleeps. I believe that the reason he won’t cuddle with me is because evolution has taught me to keep my back to him so that the family jewels stays safe. Eventually, as evolution as taught any parent of only one child, to keep one child entertained, you need another child. Unless, the Kid has a scheme to be the only child that I am unaware of. Now that the Kid is coming into our bedroom our dog has deemed it right to come into bed as well. I could deal with this if she slept at the foot of the bed but she is worse than the Kid. She will curl up right next to my leg, which looking at the replay (why we have a camera in our bedroom is another post for another blog that my family doesn’t read or know about), leaves me with about 6 inches of bed to sleep in. Whose idea was it to get a dog anyway? The answer to that question is me. As I write this I realize that everything is my fault. I woke up the Parenting Gods! It was my decision to get a dog, that now comes into our bed because the Kid won’t sleep in bed, and because his dad decided that he was a parenting expert, wrote a post that woke up the Gods and now, no one in this house is getting any sleep. I think I have just accepted, I am a man and I am wrong all the time. Not only that but I will never sleep again! you could make one of those fancy beside-the-bed-dog-bed things… http://lifestyle.allwomenstalk.com/unique-items-of-home-decor-for-pets/5/ one on each side, one for the kid and one for the dog 😛 then, even if they kick you guys out of bed, you’ll have a 4×4 cushioned box to curl up in! Do not even get me started on this. I can’t figure out how to get my five-year-old out of my bed. UGH! I will count myself lucky that we have a smaller 3-year-old then!